This blog post is the first article in a series of content monetization blog posts where we’ll tend to cover different OTT monetization solutions. However, this one will focus more on the subscription model as such. For many consumers, the era of OTT video is a dream come true. Consumers of all ages are finally able to access the content they want and from any device on their disposal. No more waiting until Sunday 9 p.m. to watch a favorite show or paying for hundreds of channels just to get six standbys. The age of over-the-top (OTT) video content is here to stay. Most consumers access OTT content every day, and as the availability of offers expands, the world’s appetite for OTT content will likely grow at an ever-increasing pace. eMarketer estimates that 181.5 million U.S. consumers will use connected TVs at least once every month – resulting in more more than 55% of the U.S. population. Additionally, by 2021, that number is expected to expand to 194.4 million, which is almost 58% of the population. In the EU uptake is strong in Germany, Spain and the UK due to expanding content offerings across markets. User growth rates in these countries will increase by double digits in 2019, and reach one-quarter of the population by 2020. What is OTT Video Content? OTT content is a broad category defining any media which is delivered over the Internet without requiring the involvement of a multiple system operator (MSO), for example a cable or satellite provider. If you are a content owner or distributor you’re very likely to recognize that OTT presents an unprecedented opportunity to offer your content directly to your consumers. 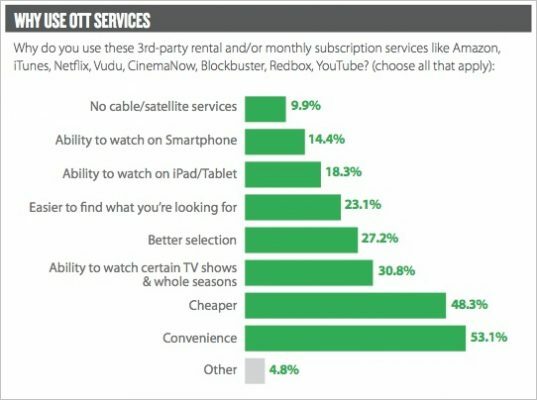 In the same fashion, content providers realize the great need for a viable way to monetize OTT content. You don’t want to be caught, like some print publications in the past, without a way to turn your content into a robust revenue stream. As people listen to, watch, and stream more content, content owners and distributors see the huge consumer demand for OTT video. The question is how do you monetize it most successfully? There are a number of options available. These options range from tying OTT content to traditional products and advertising based offerings to VOD and subscriptions. So what’s the best way to monetize OTT content? According to many video professionals, the most viable OTT monetization model is the subscription. In an age where the attention span is decreasing rapidly consumers want to access their content from anywhere, anytime and on any device. The subscription model as such and other automatically recurring revenue-based monetization models give consumers exactly what they want. We live in an era where the consumer choice and user experience look likely to be combined with fast and scalable solutions. Subscription has emerged as the leading OTT video monetization option mainly because content owners can use the subscription model to maximize the value of their content and capture data of their audience. A recurring subscription means consumers go beyond the subscription. They establish a relationship with their audience. They cease to be just viewers or listeners; they choose to be your customers on an ongoing basis. Just as crucially, subscription provides a foundation on which to build a multi-device user experience. Following an initial sign-up, your content follows the customer across whatever devices they use. Many of the most successful OTT companies, such as Netflix, have already chosen the subscription model, and they are willing to continue with subscriptions and/or other recurring revenue-based models. For instance, Amazon Prime, which includes OTT content as a key benefit (marketed as a membership, not a subscription), has seen explosive growth in recent years. Subscription (like other forms of automatic recurring billing) has proven worthy to overcome all the drawbacks of other monetization avenues. It also offers several advantages that other models can’t match. Predictable revenue streams guarantee that the consumers who subscribe to services pay for them automatically on a regular basis. A lot of OTT subscription services start with a free trial but allow cancellation at any time. This makes the initial signup easier and at a low-risk for the consumer. Price offering can be redefined and promoted accordingly to maximize customer acquisition and retention. Once consumers have subscribed, they are less likely to switch to competing offerings. Provided that the OTT platform maintains a high-quality user experience and keeps up with appealing and fresh content all the time. Building stronger relationships means improving the way subscribers access OTT content across different devices. Also, the option of ad-free content offers a superior experience for which consumers are willing to pay a premium. How To Become An OTT Video Service Provider? As audiences clamour to watch video streaming content online so OTT streaming seems to be a popular area of activity for many, including media giants such as Sky UK, and HBO in the US. Of course not everyone has the huge resources available as these companies but that doesn’t mean you can’t enter the OTT arena. However, being aware of what is needed to become an OTT provider is crucial.There’s a lot to consider, from content to technology. In a world where more and more people are watching content on an IP enabled device, in 2018 this figure was more than 60% of customers surveyed globally, the revenue possibilities from OTT video are huge. The problem is that many major players, such as HBO have access to an extensive library of content, so smaller independent providers have to rise to the challenge of providing useful and audience enticing content that they can obtain at a reasonable cost. Content also has to be updated, as if content remains static potential viewers will lose interest. Many OTT providers make the mistake of concentrating on the hardware required to deliver the service and forget that they need to deliver a high quality product to the viewer. Take one look at Twitter during peak viewing times and you will see that the amount of traffic increases, much of it discussing the latest TV shows. Many shows now benefit from live tweeting with cast members during screening. Take the latest example of Game of Thrones Season 8 Premiere. As an OTT provider you can make use of this tool by having provisions such as the ability to tweet experts during the streaming of sporting events. Social media helps spread the message about your brand, and engage more viewers. One important thing to consider, if you are looking to become an OTT service provider, is that you won’t be able to do it alone. You need someone who can provide a platform on which to provide your service, including all the technical aspects such as encoding, formatting and encryption. Your platform needs to benefit from the insertion of advertising, and from integration with your social media presence. You also need a reliable source of content. Don’t forget this needs to be an ongoing source of relevant content that appeals to the demographic you are hoping to reach. It’s a time consuming and delicate process to become an OTT provider but the financial rewards are potentially huge. Great content can put you on the path to OTT success. Bolstering your offering with a paywall platform designed to support OTT subscriptions will get you even further. Moreover, the industry has become an increasingly challenging environment for small content providers with a high demand to deliver niche content. This means not only offering must-have content, but also delivering a high-quality product that always works. Combining support for time-to-market speed, proactive retention, global reach, and more, InPlayer solutions can help you continually improve subscription and recurring OTT revenue.